ATI Lab is an aquarium water testing service that measures 43 different water parameters using an ARCOS II ICP-OES (Inductively Coupled Plasma - Optical Emission Spectrometry) machine along with two other test techniques to provide you with a complete and comprehensive water analysis. The kit contains 3 test tubes to sample both your RO water and aquarium water for a complete analysis at an incredible price. Results are available online and future tests are recorded in your profile so you can chart your tank’s history. The ARCOS II ICP-OES machine can detect trace element concentrations in your aquarium water down to 1 µg/l (0.001mg/l). Measurements are affected by salinity so that readings are accurate and results can be counted on with complete certainty. 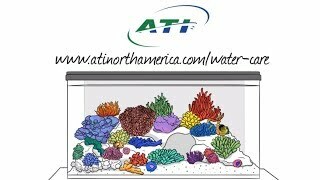 ATI Lab water testing service is designed to be used in conjunction with ATI Essentials and ATI Elements supplements. Once you are armed with truly accurate water quality measurements from ATI Lab, you can use ATI Essentials for the day-to-day replenishment of major and minor elements and ATI Elements to fill in the occasional gap. Performing partial water changes to correct water chemistry or compensate for trace elements will became a thing of the past. You will ultimately save time, money, and grow more robust and colorful corals! To keep your reef tank parameters stable and at ideal levels, use the ATI DP-6 Dosing Pump to automatically dispense your favorite ATI brand supplements. ATI Essentials Pro is a super concentrated two-part system that will replenish all necessary elements that reef aquariums demand and consume, at a level on par with natural seawater. With more than 20,000 water analyses, the information provided from those analyses has enabled ATI to improve the recipe of their Essentials recipe, bringing us the Essentials Pro. The components needed to maintain a reef system are all present to help with the calcification and construction of new skeletal growth like: calcium, carbonate, magnesium, strontium, and barium. ATI Essentials Pro also provides the elements for your corals metabolism and coloration, such as: boron, bromine, fluoride, potassium, cobalt, chromium, iron, iodine, lithium, manganese, molybdenum, rubidium, sulfate, vanadium, zinc etc. The Essentials Pro is ready to dose, and does not need to be diluted. All of the necessary elements come premixed in the two Essential Pro bottles, saving room in your storage areas around your tank. Since no reef aquarium is alike, they all continuously consume substances from the water in order to grow. Essentials Pro will continuously supply a ratio of supplements that typical reefs demand and consume, at an optimal level. ATI is a German based company that specializes in high quality T5 lighting products as well as a line of skimmers and aquarium filter media. Their T5 bulbs and fixtures have become one of the more popular brands of reef enthusiasts.